Coat of Arms - Skillman Family Association Inc.
During the late 1960s, while doing research at the The New York Genealogical and Biographical Library, John E. Skillman III discovered a description and drawing of the Skillman coat of arms penciled on the back page of a copy of The Skillmans of New York by Francis Skillman. Although the book was published in 1892, there is no immediate way to date or verify the authenticity of the hand-drawn coat of arms depicted therein. However, when translated from latin to english, the motto reads “By Skill and Courage,” and the heraldic elements are consistent with a coat of arms related to military accomplishment. 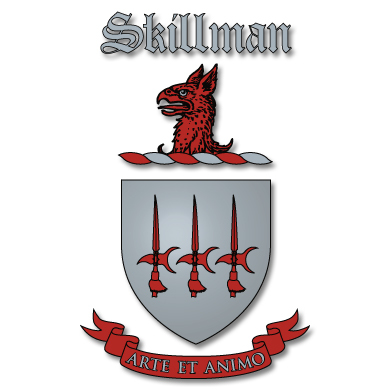 It is reasonable to assume that only a person with a sincere interest in Skillman family history would have rendered a Skillman coat of arms in a book about Skillmans. The coat of arms depicted is more likely an authentic coat of arms than the made-to-order types which have been sold by companies motivated by profit rather than historical veracity. Based upon this evidence, the image above and the description below are consistent with the drawing and the traditional rules of English heraldry. According to Wikipedia®, heraldry is the profession, study, or art of creating, granting, and blazoning arms and ruling on questions of rank or protocol, as exercised by an officer of arms. Heraldry comes from Anglo-Norman herald, from the Germanic compound harja-waldaz, “army commander”. The word, in its most general sense, encompasses all matters relating to the duties and responsibilities of officers of arms. To most, though, heraldry is the practice of designing, displaying, describing, and recording coats of arms and heraldic badges. Historically, it has been variously described as “the shorthand of history” and “the floral border in the garden of history”. The origins of heraldry lie in the need to distinguish participants in combat when their faces were hidden by iron and steel helmets. Eventually a formal system of rules developed into ever more complex forms of heraldry. Name – The name “Skillman” is emblazoned atop the crest in traditional old English type. Griffin – A symbol of valour and death-defying bravery; vigilance. The griffin, griffon, or gryphon (Greek: γρύφων, grýphōn, or γρύπων, grýpōn, early form γρύψ, grýps; Latin: gryphus) is a legendary creature with the body and tail and back legs of a lion, and the head and wings of an eagle, and an eagle’s feet as its front feet. As the lion was traditionally considered the king of the beasts and the eagle was the king of the birds, the griffin was thought to be an especially powerful and majestic creature. The griffin was also thought of as king of the creatures. Griffins are known for guarding treasure and priceless possessions. In antiquity it was a symbol of divine power and a guardian of the divine. Some have suggested that the word griffin is cognate with Cherub. Torse – Originally a protective pad worn under a knight’s coif and helmet, covered by a pair of ribbons, of the principal tinctures of the shield, twisted together and extended far enough down the back to be seen beneath the helmet from the rear. Shield w/Halberds – A halberd (also called halbard, halbert or Swiss voulge) is a two-handed pole weapon that came to prominent use during the 14th and 15th centuries. Possibly the word halberd comes from the German words Halm (staff), and Barte (axe) – in modern-day German, the weapon is called Hellebarde. The halberd consists of an axe blade topped with a spike mounted on a long shaft. It always has a hook or thorn on the back side of the axe blade for grappling mounted combatants. Gules (red) – Warrior or martyr; Military strength and magnanimity. Argent (silver) – Peace and sincerity.